I love making special things in my kitchen during the holidays and this Christmas chocolates recipe is my absolute favorite. 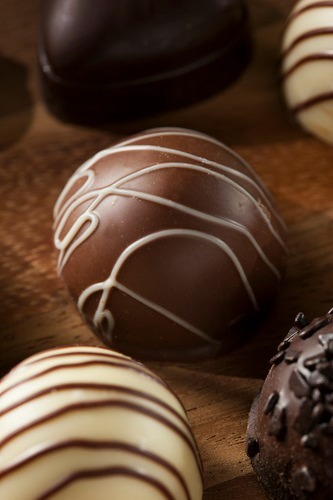 Not only are the chocolates delicious and attractive, but they are so easy to make. Every year I make several little homemade fabric covered boxes and put four of these chocolates in each to give to friends and acquaintances. They are eagerly anticipated. Try making some for yourself and then make some for your friends. Put the cookies in a blender, cover and process until finely crushed. Beat the cream cheese and crushed cookies in a small bowl until well blended. Roll into 3/4 inch balls, cover and refrigerate for at least one hour. Dip half the balls in the white chocolate till completely coated and put on wax paper to harden. Next, heat the milk chocolate, dip the remaining balls till completely coated and put on wax paper to harden. Drizzle the remaining milk chocolate over the white chocolate balls and the remaining white chocolate over the milk chocolate balls. Optional: Mix some red or green food coloring in the remaining white chocolate and drizzle over any of the balls.